JNN 14 May 2014 Riyadh : After almost a losen War of Terrorism Infested by Saudi Kingdom and US in Syria , Saudi Arabia is ready to negotiate better relations with regional rival Iran, Foreign Minister Prince Saud al-Faisal told reporters in Riyadh on Tuesday. Prince al-Faisal added that the kingdom has invited Iran’s foreign minister to visit Riyadh, hinting at a possible thaw between the Gulf’s two biggest powers. “Iran is a neighbor, we have relations with them and we will negotiate with them,” the Saudi minister told reporters in Riyadh. Iranian Foreign Minister Mohammad Javad Zarif has visited most of Saudi Arabia’s Gulf Arab allies including Kuwait, Qatar, Oman and the United Arab Emirates since the nuclear pact, which eased some Gulf Arab worries, but has not been to Riyadh. 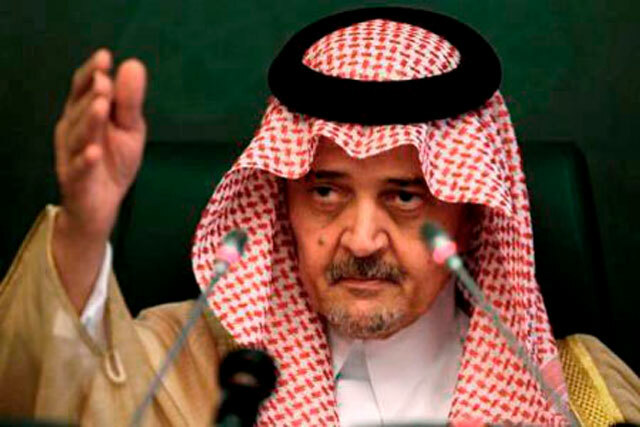 Saudi political analyst and writer Jassir al-Jassir described Prince al-Faisal’s announcment as a “bombshell” and a “major shift” in Riyadh’s position toward Iran. He said the regional powers could seek agreement on regional issues in Lebanon, Iraq , and in particular on Syria and Afghanistan, As in Afghanistan where Abdullah Abdullah is all set to win the second round of Presidential Elections , as He already achieved the Major Chunk in the Ist Round of Elections where he came first to secure the Highest No. of votes , but could not achieve to secure the required above 50% votes , So in this regard 2nd Round was now being held , but seeing his eminent Victory in the Run off Election , the Third No. Contestant Zalmay Rasoolof , and the former Governer of Kandhar Agha Sherazi , has also announced their Backing in the coming elections , which also gives Iran a better edge in the Afghanistan , in the scenario , when the US and the allied forces have to leave the country , in the absence of any agreement , to stay further in the country , which is even a losing option , for the Saudi Sponsors of Taliban , Who have Presence in only 8 Provinces of Afghanistan , out of 32 provinces , and Iran and its allies again a Major stake Holder in Afghanistan . Iran and Saudi Arabia have been deeply divided over a number of regional issues, particularly the three-year-old conflict in Syria. Where Saudi and US Govt Invested heavily in the Weapons and even in the recruitment of Terrorist from around the World to Dethrone the Government of Bashar al Assad , but they could not achieve it even after investing heavily in the conflict , while the Assad Government , with the help of Iran , Russian and China and its allies , have now a Upper hand in the So called War , as they have gained Control over the Major Cities , Towns and as the Momentum has come in their favour , so every day they are taking control of new towns and areas , which were Previously under the control of the Terrorists . And these victories in the Syrian War by the Government Force loyal to Assad , who is a staunch ally of Iran has Blown away the Saudi and the US Hegemony from the Region and Iran has come up as a Strong Regional Player , who has now a say in the World Politics , as have even successfully negotiated a deal , with US and the West over their Nuclear Projects , and Now in the Process of relaxation of embargos and Bans from the West. The Saudi kingdom supports the Syrian opposition has thrown their Utmost support and its total weight behind efforts to overthrow President Bashar al-Assad. On the opposite, Iran supports the Assad’s regime, backing him Politically and Strategically . Faisal’s remarks came as U.S. Defence Secretary Chuck Hagel was in Saudi Arabia on the first leg of a regional tour focusing on Iran’s nuclear program and the war in Syria. U.S. officials have struggled to reassure Gulf allies, particularly Saudi Arabia, over the interim nuclear deal that the major powers struck with Tehran late last year and which Riyadh fears will embolden its rival in its regional ambitions. Washington’s caution about arming the Syrian rebels has also soured its relations with its longtime Saudi ally. After his election last July on a platform of ending Iran’s international isolation, President Hassan Rowhani said he was particularly keen to reach out to Gulf Arab governments. This entry was posted in Middle East and tagged iran, Negotiation, saud al faisal, Saudi Arabia, Zarif. Bookmark the permalink. MAKKAH MUKARAMAH AND MADINA E MUNAWWARAH SHOULD BE GIVEN A VATICAN LIKE STATUS . IF THEY DO NOT ACCEPT , LET THEM BE BOYCOTTED BY EVERY ISLAMIC NATION AND SAUDIS BE TREATED EVERYWHERE LIKE LOW CASTE INFIDELS . this invitation is welcome news, if made in all sincerity- a positive step for two middle eastern superpowers to work hand in hand to bring peace to the region.Such a step would would attract Allah’s mercy and Blessings for it would save lives and bring prosperity to the region.It would not be a “weakness” for either of these two contries to talk to each other for the reality at ground level has shown that the tables have turned over a period of time.